In this post I want to give some background information about the Experimental Gameplay Project February entry “Infinite Floating Islands“. These will cover some of the unrealized ideas and features of the game and some technical background. Additionally I will sketch some possible future plans what to do with my proof of concept. 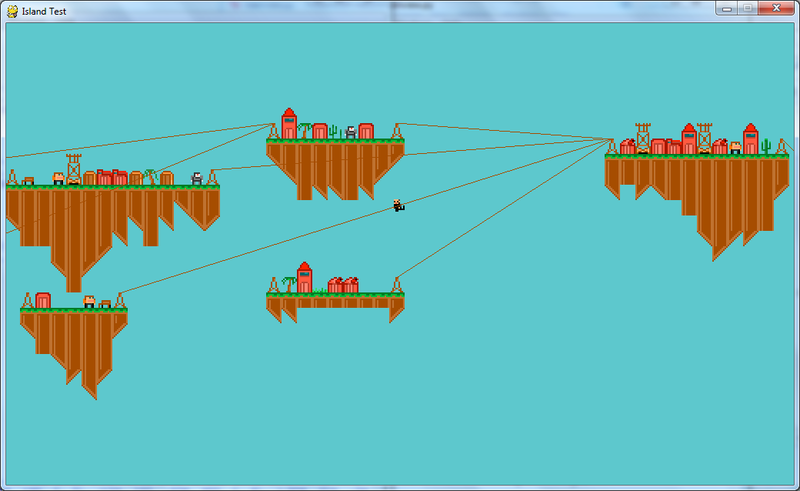 The idea to make a 1,5D sidescrolling game for the infinite game world theme came quite early. I thought more about technical limitations of an infinite game world than game mechanics in the first place, so a 1D approach where the player only can travel left and right seemed appropriate. First mockup of the game. The coordinates should be saved for faster access in minimap creation. Every other attribute of the islands could be re-generated based on the seed with the island’s seed saved for faster processing. Unfortunately I didn’t manage to implement any saving of the world data within the week of the challenge. Aside from saving the world there were some other things I initially planned to implement during the development week. The most important one would have been some sort of local biomes so that the player would reach different areas while travelling. These areas would have a different randomized setting for the procedural world and island generation with alternating sets of sprites and background colours. I think this would have made the exploration way more interesting. Additional missing features are more of a visual nature. One should have been an open cable car to travel, similar to the one on the mockup above. Thinking about expanding the game idea I have some more features in mind to make this into a real game. At the time writing this there have been 55 downloads of the game archive. I didn’t get any direct feedback by now but this number is quite impressive for my personal context. For me personally this one week challenge was a great experience about how far I can come within these constraints. So I’m quite motivated to expand this game idea which brings me to the final part of this post. Admittedly the actual release of the game prototype is quite buggy. I plan to remove the bugs which mainly were caused by dirty coding under time pressure. 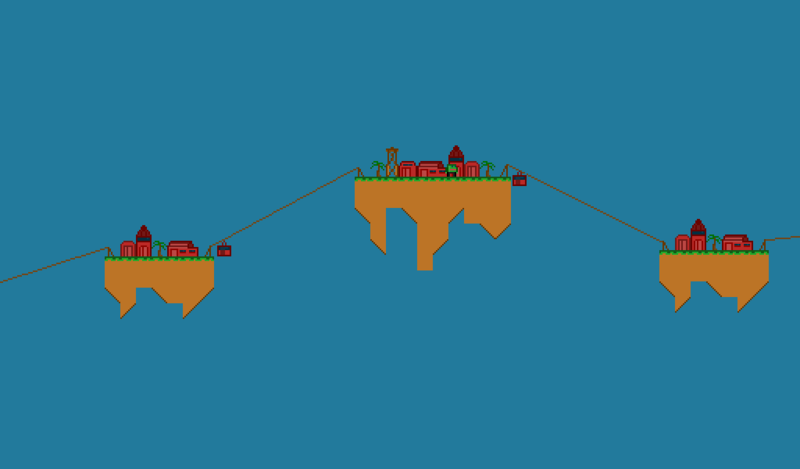 Additionally I’d like to add distinct areas the player can reach while travelling. This improved version I would like to post to a broader audience for some feedback (TIGsource forums for example). At least this bug is already sorted out. Let’s see what will evolve from the Infinite Floating Islands.